I’ve been on the peppermint mocha kick since November so when I finally found the peppermint bark Oreos at Target this week, it reignited my love for all things peppermint and chocolate all over again. 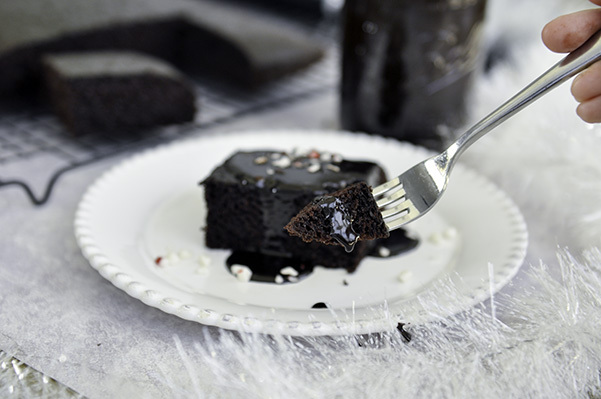 But wouldn’t it be great to have those flavors in a soft, super moist chocolate cake? The answer is is always YES! This cake comes together fast. I think I say that a lot about my recipes, but when you’re a mom of two, between school drop offs, pick ups, errands and making dinner, I need a recipe that comes together as quick as possible! Especially when mama needs her chocolate fix! 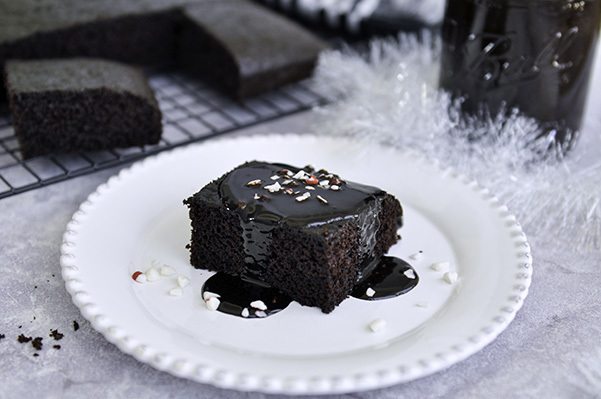 The cake bakes up dark, moist and decadently chocolatey. All the fundamentals of chocolate cake baking, don’t you think? But the real magic happens when you pour over this fudge sauce. It’s adapted from the Pioneer Woman, so you know it’s going to be insanely delicious. And it is. This fudge sauce recipe makes a good amount, so I put it in a jar and heated it up for ice cream too! Please, please make this cake. Your chocolate peppermint craving brain and tummy will thank you! Adjust an oven rack to the middle position, and heat the oven to 350F. Spray a 9-inch square pan with non stick spray and line it with parchment paper. In the bowl of a stand mixer fitted with a paddle attachment, mix together the sugar, flour, cocoa powder, baking powder, baking soda, espresso powder and salt. In a separate large bowl, whisk together the sour cream, oil, egg, peppermint extract and vanilla. Turn the mixer on low speed and slowly add the wet ingredients to the dry. Then add the coffee and mix on low to combine. Scrape the bottom of the bowl with a rubber spatula to make sure it’s fully mixed. Pour the batter into the prepared pan and bake for 27-35 minutes, until a toothpick comes out with just a few crumbs attached. Cool in the pan for 20 minutes, then turn out onto a cooling rack and cool completely, removing parchment paper. To make the fudge sauce: In a small sauce pot whisk together the cocoa powder and sugar. Add in the cream and stir to combine. Place the pop over medium heat and whisk till it has heated and thickened. Stir in the butter one piece at a time till it has completely melted. Take the pot off the heat and stir in the vanilla and peppermint extract and pinch of salt. Allow the sauce to cool slightly. It will thicken as it cools. Pour the warm sauce over a generous slice of cake and top with crushed candy canes. So So good!